On the hunt for the perfect Father's Day gift to replace an old worn out French press, I was curious what other coffee makers were on the market. My dad is the only coffee consumer in the household, but does has a daily cup of coffee in the morning. The main driver of the French press over a traditional coffee maker is the capability to brew a single serving of coffee instead of a full pot. Like other purchases, price is an important aspect of the decision. The most obvious single serving coffee machines are K-Cups, but there is plenty of reason to avoid K-Cups. The plastic pods are un-recyclable, and therefore bad for the environment. Learn more at killthecup.org! Though cheaper than buying a cup of coffee at Starbucks or Peets, it's still much more expensive than brewing your own cup of coffee. Limited selection of coffee, some of which can be pretty bad. Even though K-Cups are admittingly more convenient than coffee makers, the extra few seconds it takes on a traditional coffee maker is worth the cost of the environment. The better alternative to K-Cups is single serve coffee machines. 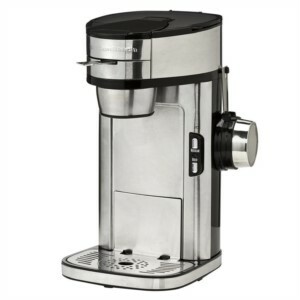 After some online research, I found the Hamilton Beach Single Scoop Coffee Maker highly rated coffee machine that does not require K-Cups. The price of the Single Scoop is only $35.99 and ships in 2 days with Prime. Like most reviews, so people give less than stellar reviews, but many of those reviews point to a lack following the instructions stated in the manual. Coffee filters not required (though some users prefer the coffee taste when brewed with a filter). Different brewing settings: Regular and Bold. Fairly Easy Clean-up, only rinse two mesh filters. Stainless Steel construction means no cheap plastic looks. Requires cold tap water that instantly heats to 200 degrees. A full 8 oz cup of coffee in 90 seconds! Unhappy with the taste of your coffee? Try varying the manufacturer of your pre-ground coffee. Different grinds will result in different outcomes. Better yet, some users suggest grinding your own coffee beans to vary the grind size that works best for your taste. Overflowing? Make sure you don't fill coffee grinds past the MAX line. It's all in the instructions! Sediment or Sludge in your Coffee? Your grind is probably overly fine. Try a coarser grind... or grind your own beans! Coffee Not Hot Enough? Try starting with warmer water instead of cold tap water.